Grandfather Mountain has been an icon in North Carolina’s landscape for generations. This state park opens the mountain’s 2,456-acre backcountry to hiking and backpacking. The park is known for some of the South’s most severe weather and challenging terrain, with trails that have hikers scrambling along cliffs and up ladders. Grandfather Mountain State Park is distinct from the Grandfather Mountain nature attraction which occupies a portion of the mountain area and provides visitors with paved road access to the mounbtain's peaks and its wildlife attractions. The state park lands were purchased from land owned by the Morton family and by its non-nonprofit Grandfather Stewardship Foundation which operates the nature park. Grandfather Mountain's stone profile faces have long gazed out over the ancient Appalachians, earning the acclaim of explorers and botanists alike as the apex of the Blue Ridge in grandeur and ecological diversity. Towering nearly a vertical mile over the Piedmont, Grandfather has been recognized for centuries as a sentinel summit. In 1794, the mountain's dramatic views convinced the Botanist Andre Michaux that he'd climbed "the highest peak in all North America." From alpine-like vegetation and vistas on the highest peaks, to cascading streams far down in the foothills, more than a dozen distinct ecological zones stretch across the landscape. Seventy-plus species of rare, threatened and endangered plants and animals populate this rugged mountain, making it one of the East's most significant peaks and a United Nations International Biosphere Reserve. 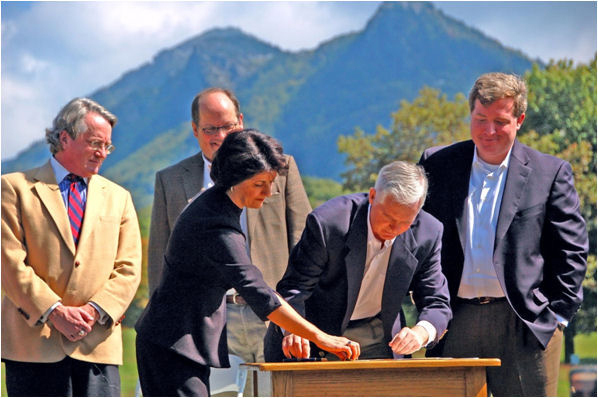 In early 2009, the General Assembly formally authorized Grandfather Mountain State Park. North Carolina Division of Parks and Recreation. Grandfather Mountain State Park. 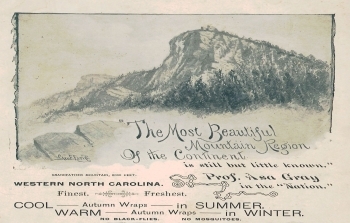 https://www.ncparks.gov/grandfather-mountain-state-park (accessed November 8, 2015). [The most beautiful mountain region of the continent / Season of 1892]. Brochure. ca. 1982. Collection of North Carolina State Parks. [Governor Mike Easley announces agreement for State of N.C. to purchase undeveloped park lands at Grandfather Mountain]. Photograph. September 29, 2009. Collection of North Carolina State Parks. Windsor, Matt. 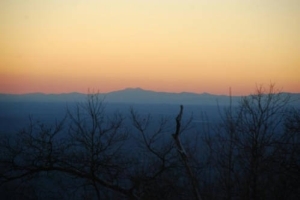 "Grandfather Mountain at Sunset." Photograph. March 2003. State Parks Collection, North Carolina Digital Collections. http://digital.ncdcr.gov/cdm/ref/collection/p16062coll27/id/243 (accessed November 8, 2015). 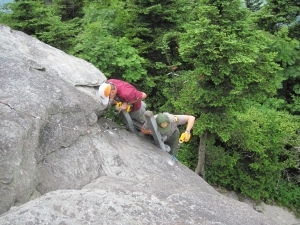 [Staff replacing rock anchors on McCrae's Peak, Grandfather Mountain State Park]. Photograph. No date. Collection of North Carolina State Parks.